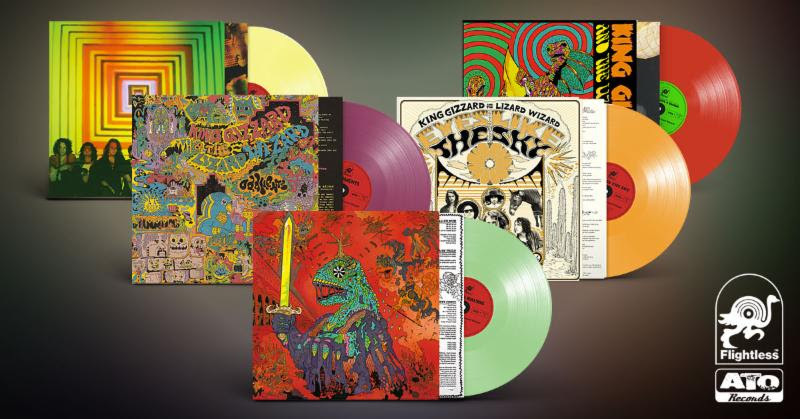 King Gizzard fans have been waiting for this day as their first five titles are being reissued which include reimagined artwork, packaging, liner notes and fresh vinyl colors. ATO has set variants that are limited to 2000 copies each and Flightless Records has limited variants which are 5000 copies each. This major release also comes with a great announcement that Flightless and ATO Records now have an exclusive label and distribution partnership for North America. Flightless Records was started by Eric Moore (drummer and manager of King Gizzard) in Melbourne in 2012. Flightless Records has released & signed artists such as The Murlocs, ORB, The Babe Rainbow, Stonefield, Amyl & The Sniffers, Leah Senior & Pipe-Eye. If you have been paying AUS import prices for these excellent offerings this announcement will help your wallet and will turn on more fans to the Australian rock movement. Willoughby’s Beach is King Gizzard and the Lizard Wizard’s second EP, originally self-released in 2011 and limited to 350 hand numbered copies. The reissue features new artwork re-imagined by Ican Harem and comes on red(ish) colored vinyl. 12 Bar Bruise is the debut full-length album by KG&TLW originally released in 2012 and limited to 500 hand numbered copies. The reissue includes new artwork reimagined by Jason Galea and comes on doublemint green colored vinyl. Eyes Like The Sky is the band’s second full-length album released in 2013 and originally limited to 500 copies. A cult western audio book, the album tells a story of the American Frontier. The reissue features new artwork re-imagined by Jason Galea and comes on Halloween orange colored vinyl. Float Along – Fill Your Lungs is the band’s third full-length LP released in 2013 and includes the psychedelic fan favorite “Head/On-Pill”. The reissue features a double-sided fold out poster and comes on Easter-yellow colored vinyl. Oddments is KG&TLW’s fourth studio album released in 2014. It features a collection of “odd” songs recorded between 2007-2014 and was originally limited to 500 copies. The 2018 reissue features a re-designed gatefold of original artwork by Jason Galea, and comes on grimace purple colored vinyl.